Luxury accessories company Andre Lorent is ending its four-day customer appreciation sale that marks its recent release of new wine aerator. VinLuxe Wine Aerator fully decants the wine 300% faster than the traditional method. Recently, luxury accessories company Andre Lorent released their globally-patented VinLuxe Wine Aerator to rave reviews and a grateful wine-loving public. As much of an inconvenience as decanting wine may be, it’s widely acknowledged as a necessity for enjoying the wine at its best. Decanting introduces oxygen to the wine, both through the opening of the bottle and the movement of the wine as it is being poured. However, once the wine is poured into the decanter, it still needs to sit for a bit before it’s ready to drink. The VinLuxe Wine Aerator was designed to make that wait unnecessary. 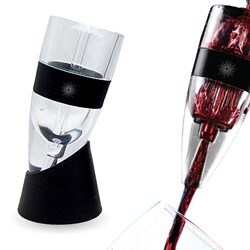 To aerate the wine using the VinLuxe Wine Aerator, the user simply holds the aerator over their glass and pours the wine through it. The wine first pours over the Umbrella Aeration System, which separates and fully opens the wine. It then passes through 32 small holes, allowing more oxygen to get to the wine and then finishes through the aeration filter tube. It then passes out of the tube and into the wine glass or a decanter. The entire process takes just seconds. The VinLuxe Wine Aerator has been recently released exclusively on Amazon and initial reviews are glowing. Wine enthusiasts report that they notice a significant difference in the flavor, subtlety and body of wine when using the VinLuxe. To mark the launch of the VinLuxe Wine Aerator, Andre Lorent recently announced a four day customer appreciation sale in which customers could get a 33% discount until midnight on Friday January 17th. Consumers can get this special pricing for one more day, by using coupon code “8E6259BL” when they order on amazon.com.